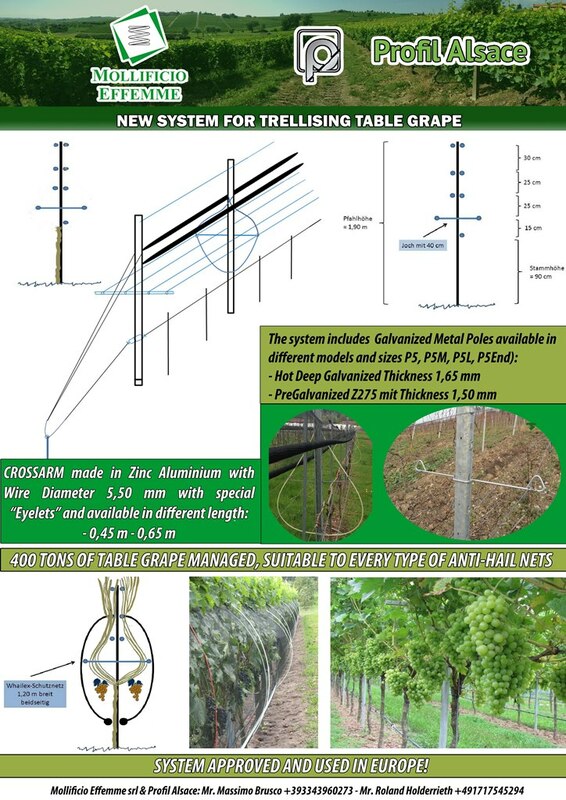 TABLE GRAPE TRELLISING SYSTEM - 30 TONS PAR HECTAR! Our new concept of table Grape System is able to manage till 30 tons of Table Grape. 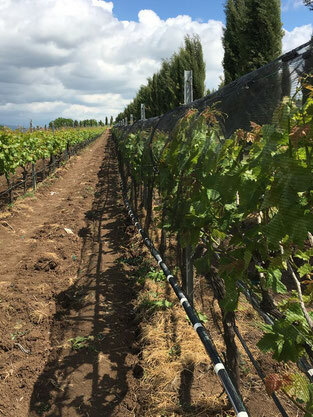 Throught the use of combined Hot Deep Galvanized Metal Post, Zinc Alluminium Accessories and High Quality Black Net, the system allows you to have an economic but sturdier Trellising Table Grape Plants. The system can be also adapted to existing Plants. Cross Arms can be manufactured for every type of Metal Concrete and Wooden Posts. The System includes all the best materials manufactured totally in Europe, In France and Italy. Metal post used are Hot deep Galvanzied --> thickness 1,65 mm, section 50 x 40 or bigger. Irrigation Pipe for Table Grape. This system has been used for years in Germany and Switzerland. According to the Agronomist Experience of your Winery, this system allows you to save money in comparison with Table Grapes Bigger Plants, Y system (Pergola). 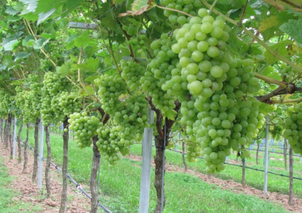 The result are very high, around 30 tons par Ha of table Grape. 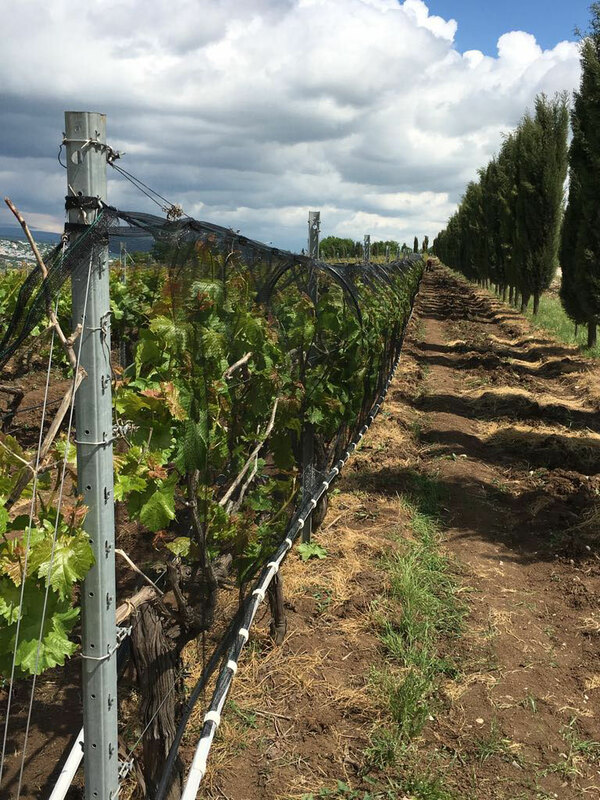 As we may know, the table grape must look nice, healthy and in a good shape so if you prevent damages by the use of a suitable anti-hail net. 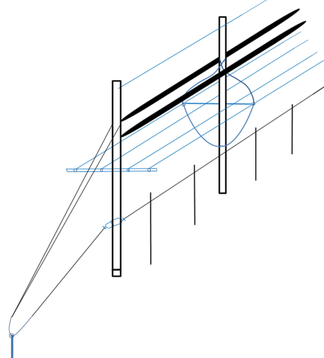 Every Intermediate Poels has a specifi Accessories "U" shape (see on the left) wiich help the net to absorve the speed of the hail coming from the sky. More Over, the CrossArms help you to keep wide the raw till a distance of 30/40 cm par side (60 / 80 cm in total) with high benefits for the grapes. PLEASE CONTACT US FOR ANY INFORMATION YOU MAY NEED. JUST CLICK HERE.